We always use peat-free compost, which we do not find causes any issues, but since we installed to our new posh flood-bench irrigation system last year the compost we were using tended to hold too much water and something more free-draining would be better. When we were originally choosing our compost we attended the Four Oaks commercial growers show as a good way of speaking to the suppliers and seeing their products, and from there identified two worth testing. 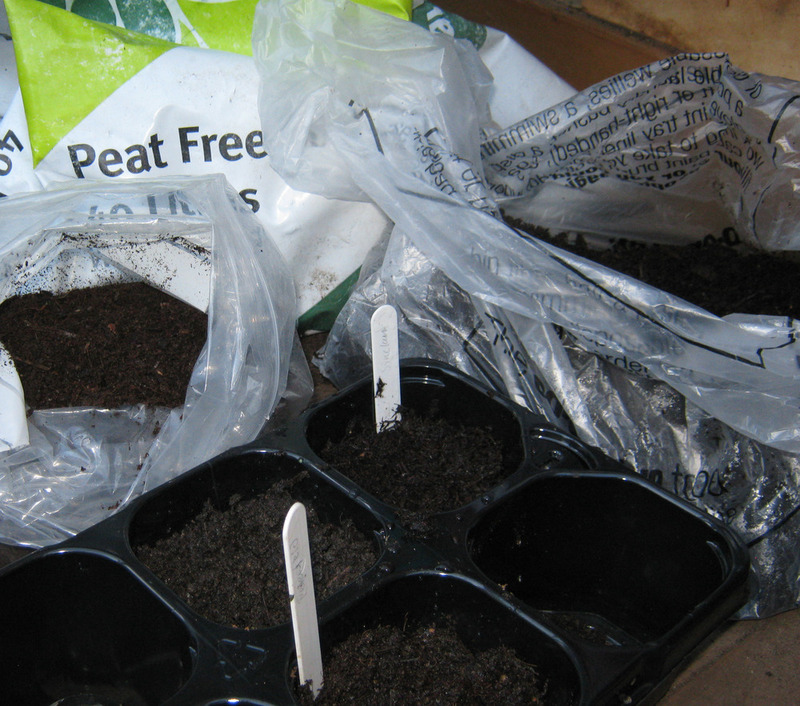 We chose Petersfields peat-free supreme and have since changed to thier peat-free, high coir version as we found we wanted the extra drainage. Its proved to be excellent as it is open enough for quick rooting. The low loam content does not seem to leak out of the holes at the bottom, which is important as we water from below in flood benches. Its also a consistant product so well done to all those at Petersfields/Hewitts Turf. It is well known that most commercially sold annuals are not very good for bees but I wanted to see just how true this was so this year we decided to plants them and observe how the bees reacted. We created two beds each 2x3 meters and planted one with a selection of standard garden centre annuals and the other with an annual seed mix supplied by Flowerscapes, a company that know their stuff about pollinating insects. The 'six pack' annuals we tested were lobelia, stocks, pelargoniums, petunias, verbena and salvia. We then observed the beds about once a week, on a dry bright day, and simply counted the number of bees, an other pollinating insects we saw. The results were dramatic. The only plants from the six pack annuals that we ever saw any bees on where the stocks and the lobelia but out of those the lobelia was the clear winner. Typically we say one bee, usually a bumblebee, somewhere within the 12 plants we grew. The seed mix did better, the average sighting was 2.3 pollinators in the 6 square meter area; often these were butterflies and hoverflies with some bumblebees. From a gardening perspective, both beds provided a good continuous splash of colour but the annual seed mix established and flourished with only some initial watering where the garden centre annuals needed regular (once a week) watering or they stopped flowering. Personally I greatly preferred the visual effect of the seed mix with its mixed pallet of very pretty little jewels and think this is a really beautiful way to fill any temporary spare spaces in a garden, perhaps between newly planted perennials while they grow. I should be noted that neither area in this trial attracted as many bees as either a range of our perennial plugs or a solid patch of phacelia grown from seed, either of which recorded been numbers 5 to 10 times greater. Today I attended a workshop at the Laboritory of Apiculture and Social Insects - LASI to thier friends or anyone looking for snappier title - at Sussex University. The workshop focused on garden plants for bees and included practical sessions to learn their technique for assessing how attractive plants are to various different bees. Professor Francis Reitniks put it very simply; bees are very sophisticated at assessing plants value for nectar and pollen so the easiest way to assess the plants is to count bees. This is exactly what I have been trying to do at Rosybee but with a much more disciplined process - fab, and just what I needed to learn. It was also really good to meet representatives from stately-homes, local councils, beekeeping and major horticultural organisations such as Wisley and Kew, all coming together with a common goal. The plan is to run the seed trials for 3 years and to see how the flowering behaves over time. This will be our second year and I have just finished the very minimal amounts of maintenance that I think give the mixes a fair shot at success. As you can see there are some flowers now but also a lot of weeds. All the mixes we are trialling are sold by their various suppliers with claims that the flowering should last multiple years; some are mixes of annuals that are meant to self-seed to renew and others have perennials that should flower every year. In addition I have now sown a new patch of the 'French mix' in an area near the road that was grass last year. I collected some of the seed by hand to use for this and have done this for purely aesthetic reasons to have a reliable splash of colour at the entrance but it will also be interesting to see how the collected seed works. 3, the French mix was completely bare dry ground until very recently but now there are signs of a few calendula, cornflowers (see picture - right), oh and the ubiquitous nettles. We resowed one section with seed collected towards the end of last years flowering and this looks like it has a wider range of seedlings coming through but probably not the same ratios of the original mix. The dock and nettles are going to continue to be a problem and I am not sure if we should leave them or remove what we can; torn between letting nature do its thing and wanting it to look nice. I will update again when everything is in full flower and hopefully also has bees to report! I needed to research which of my plants would be ok in acid soil for one of my customers and it seemed daft not to document the findings. In addition to rosybee plants, the top acid soil plant for bees has to be heather. Beware of rhododendrons as, even though the bees are quite happy on them, the resulting honey is toxic. Try buddleia as an alternative if you want a large shrub. 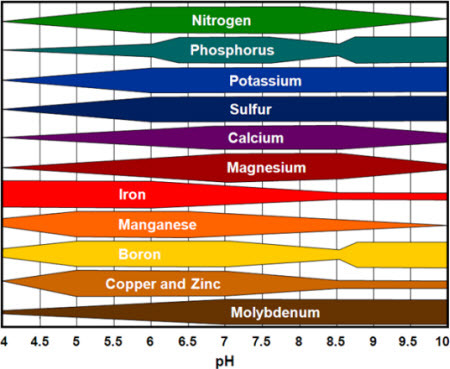 The following plants will be tolerant of acid soil up to a ph of about 6. At this time of year the bees are just beginning to emerge more regularly and very soon they will find much of their food from trees and shrubs. Most perennials and particularly most of the daisy family tend to flower later. Doronicum is a significant exception flowering as soon as the temperatures begin to head above 10 degrees. My plants are just showing buds now. Honeybees love all types of daisy-shaped flowers as they are very open and accessible. They also tend to flower for weeks opening up new nectaries on a daily basis until the centre of the flower has a fuzzy appearance. Dornonicums are meant to like damp conditions but I have found they also cope well in quite light soils. They clump up relaibly but are not invasive; all in all a very well behaved but tough garden plant. Rosybee is located in south Oxfordshire and not far from Denman College which is the head office and training college of the Womens Institure. The WI have been great supporters of the 'bee cause' since they launched thier 'SoS for Bees' campaign at thier 2009 AGM. Based on this I thought it would make sense to and see if we could share ideas. Its been a very busy year but in October I finally managed to find time to contact their head gardener, John Towler, to offer some of my seasons-end stock. John is a real enthusiast about wildlife gardening and maintains Denmans garden with an inspired balance of providing masses of colour for the many visitors and sensitivity to a birds, beasts and insects. They even have a few bee hives tucked in under a group of fruit trees. I was very kindly given a tour of the 14 acre garden; the long border is a joy for bee-lovers and I began to feel that my extra plants resembled the proverbial 'coals to Newcastle' but John is on a tight budget so I think my extra stock will find a good home. John is particularly proud of his herb garden that has a sunny spot with tall hedging protecting it from the north to create a really sheltered corner. It comprises a set of lavender edged beds brimming with mature herbs that John has allowed to flower for pollen rather than keep tidy for the kitchen. Based on this visit I have been inspired to work out a 'bee-friendly garden audit' that will allow me (or anyone else interested) to objectively assess to what extent a garden provides all round support for our buzzy friends. I am still working on the details but so far I think that Denman College will score a whapping 9 out of 10. Now in September I can report the first years results. As you would expect from the range above the results are very mixed. Weeds that we failed to fully irradicate first have been the main challenge which is very common story with seed mixes. We had sprayed the area with a general weedkiller the previous autumn so our perennial weed has not been too bad except for the nettles; our challenge has been germination of both annual and perennial weed from seeds we exposed when we ploughed in spring. We should have waited longer for that to germinate but then you loose the ideal time to sow the seeds you want. The lesson is to fully prepare the ground in autumn or sow later in early summer after the weed seed has sprouted and been removed. Mixes 1, 2 and 4 all grew quickly which reduced the content of other species of plants. The most effective at weeds suppression appeared to be mix 2, the bumblebee mix, as the phacelia grows very fast and then the clovers pack out any remaining space. The wildflower mix has the most weed as even the grass elements are slower to get established. The sellers have deliberately chosen slower growing grass types to avoid the perennial wildflowers being crowded out; the problem is that allows other weed plenty of opportunity to get in there. This patch now looks terrible but we will leave it to see how if fairs over time. The mixes with a high content of annual flowers not only won the war against the weeds but also produced the most flower this year. The two with the most flower are the 4, the French mix (pictured above in Sept) and 2, the bumblebee mix. The least flower was produced by mix 1, the DEFRA spec, which is only now producing a few flowers from 10% the clover content but the overall effect is 99.9% green. The French mix has been the most dramatic and colourful and has changed every month going from purple phacelia in June, through blue cornflowers in July and on to yellow calendula and coreopsis in August. However the phacelia, then borage, then clover content of the bumblebee mix has been more muted in shades but a very similar flower density up to August. How quickly do our plug plants grow? To show how quickly our plug plants grow to fill the space I planted up 10 of each of our stock plants and will take photos to show how they progress. I recommend that our plugs are planted roughly 40cm apart (less for some of the smaller plants) and in 18 months the emerging clumps should halve the bare ground between each plant and when in full glory will be touching. This is what you want - solid planting but not so crowded that they begin to fight each other for space. This also keeps most of the weeds under control. I cannot bring myself to leave a trial bed completely unweeded but I find I can get away with just removing the worst weeds in spring and then just pull out any horrors when passing - our plants are tough enough to win through the rest. So, if the plugs look a little sparse when you first put them in then I suggest adding some annuals (seed is the easiest) just to cover some of the space. I recommend, phacelia or borage as they will maximise the nectar and pollen supply until the perennials get established. Calendula is also useful as it will fill space quickly and flower for 4 months. Result: the will double or triple in size within 3 months from spring to autum or from autumn to the following summer. If you accept point one above, then we either do what we can or find alternatives. My view is the latter but I guess it depends on your objectives. If you want the pastoral image then you will need to work hard to acquire the right sort of land and then after several years of careful treatments to remove the plants you dont want and cultivate the ones you do then you may get something approximate ...and good luck. By the way, dont believe any seed packets or distributers that imply you just chuck in a seed mix and away you go. If you want to support wildlife then I recommend you study the foods that the critters you favour need and focus on planting the right things, regardless if the effect is meadowesk. If you want to try and preserve our native wildflowers then you can do that in a garden setting where they do not need to compete so hard with the grass for survival as they would in a meadow. Or, work to eliminate patches of grass and put in wildflower plugs rather ie avoid ploughing or rotivating a big area and this will throw up all the buried generations of weed seed. So, overall my recommendation is to work out what matters to you and focus on that. On holiday in France last summer we found noticed that as you drive through the countryside, you quite often find sections of field margins or areas at the edge of villages where there is suddenly a blaze of colour. This is because the French government have been very active in encouraging seed mixes in spare land to provide environmental benefit. (the French government is also one of those in Europe that have banned certain pesticides after working out they are harmful to the bees as well and the unwanted insects) We tracked the seed mixes down in a standard garden centre where we found a variety of mixes: some just for colour, others for birds, butterflies or pollinating insects. We bought a big bag of the bee-friendly one and this became one of the mixes we are now trialling at rosybee. 2. it grew better on slightly raised areas of soil and I suspect that the very wet April may have inhibited (rotting) the gemination of the seeds that had landed in the furrows. 3. it contains (in order of flowering from June onwards) phacelia, poppy, cornflowers, echium, wild carrot, camomile, corn cockle and calendula. 4. bee numbers in June- July range from 3 to 5 per square meter in warm, dry weather conditions during day-time, which makes this a highly successful mix for bees. I will continue to monitor as the phacelia is now almost over and it will be interesting the track the bee-count. From the look of both the seed and the results the above order reflects the ratios as it is really dominated by the phacelia with the borage coming through and odd bits of clover peeking out in places where the floods earlier in the year stopped the phacelia germinating. I cant see any sign of the birdsfoot trefoil but will give it time. Brights claim that this mix will last for 4 years with the phacelia and borage self-seeding. My guess is that will depend on how much of the indigenous weed returns. We will track it each year and record the results. Interestingly I put a patch of the same seed mix in a newly ploughed section of the main field where the soil has a much higher clay content and the plants are not nearly as high or lush. It appears that soil type will also be a factor. These two pictures where both taken on the same day in early June and you can easily see the difference. At rosybee we are undertaking research as well as providing plug-plants. Over the last few weeks we have been ploughing up sections of the site and preparing the ground for sowing a range of different commercially available seed mixes. The picture here, shows the bumblebee mix, lush and green in early June just before flowering. Our preparation was to plough, then harrow sections of our field - that has been grazing land for several decades - and then wait for the surface to get 'crumbly'. Ideally I would have liked to allow for the seed-based weeds to germinate during March it was too dry for any wees to emerge. We sowed in early April when the forecast was for rain. The area we have prepared is approximately two and a half acres which is too small for tractor sowing but too big to rake over by hand so, with the help of my daughter, we spend the weekend sowing onto the surface. We found a very handy 'spreader' with a winding handle that smoothly distributes the seed in a circle as you walk along and covers about a 3 meter wide area - very useful, but still quite a lot of walking up an down. All of these will be compared with a large area (approx 30% of an acre) of our plug plants. Most of the mixes germinated quite quickly when the rains came but the borage only started to show (pictured right) now that it has warmed up again. The phacelia in the bumblebee mix has grown the most but is much more advanced in the more loamy soil near our access way than in the heavy clay soil in the main field. We can also see a certain amount of dock and cow parsley coming up too but that was inevitable and we will just have to live with that. We now need them all to flower so that we can count the bees as the main focus of the research. One house in our village has decided to take out the grass in front of their house and plant a nectar rich meadow area instead. Penny and Dudley are well known in the village and actively involved in a number of environment related activities: Dudley is a biologist by training and now, retired, has become the local wildlife expert; Penny is a passionate gardener. Together, their vision is to try and encourage the entire village to make more environmental use of any patches of spare land to benefit pollinating insects. Fabulous! The picture shows how thier front garden looks in May, about 8 weeks after planting this seed mix and a few of my plug plants to give it a boost. The dry weather in March delayed germination and then the grim April delayed growth but it is now coming on well as you can tell be the green fuzz effect. In parallel with their activity we have also been planting a range of nectar rich seed mixes at Rosybee which I will be tracking and comparing. Anyway, "well done" to Penny and Dudley. Most of the infrastructure we need for nursery is now in place so it is time to start developing the site itself. Our vision is to fill four acres with all types of bee-friendly plants, shrubs and trees. At the heart of this will be the research plots where we will test out some of the best selling 'nectar rich' seed mixes and compare them with plug grown perennials. The first step has been to get the plough in to break the turf in 3 big sections. Our soil is very heavy compacted clay so the ploughing has raised it up like giant, 60cm high, butter curls. (see the big ridges at the edge of the picture above) In this condition its hard to imagine how it will ever be a workable texture that I can so seed into. But they assure me that once it has dried out a little then next stage, harrowing, will break it down much more. In the mean time our daughter thinks is a new adventure playground! I wrote the above text before we had got round to taking a picture and 2 hours later I find that they have already been back with the harrier!! Speedy. So here is how the 'avenue' looks all nice and freshly tilled; ready to sow. This area will be planted with 3 different commercial seed mixes so should look pretty until the grass begins to dominate. It so exciting to see the the new growth pushing its way up and to know that the plants have made it successfully through another winter. The first trial bee plot is now entering its third season and so the perennials as well established (as are a few weeds) and I can also see how the self-seeding annual plants are working. Both the borage and the mysotis have self seeded well and seem to work fine together covering early and late season. The Chieranthus Chieri was three years old last season and getting a bit woody but produces a carpet of seedlings which are now growing on beutifully and I expect will be flowering by April. The only plant which does not seem to have seeded is the biennial echium vulgare. I think this is becuase it was planted in the shade of some taller plants and did not get enough direct sun. I will restock with some spare plugs in a sunnier area. In the process of doing the groundworks and laying trenches for water/power connections we have dug up quite a few areas of our field with some interesting results. We first noticed the interesting alluvial layers when we dug the 200m long services trench; we found we a layer of clay on top but under that it is mainly a one meter layer of ballast made up of small mainly chalk pebbles, sand, grit and some clay. Below that we hit the thick blue clay 'Kimmeridge' that made this area so attractive to Thames Water for a reservior (they would have had a natural waterproof base). We also hit spots of more dense clay and sometimes sandy stuff. Clear signs of the ancient riverbed that is now the Thames valley. This picture shows the layers in the hole we dug for the sump. You can just see grass at the top then 30cm of light clay, then pale ballast, the dark clay below. The red mark in the centre is where we have cut through a nineteenth century land drain which indicates they has issues with the site too. This study has been made even more interesting by trying to work out how porous - or not- the topsoil layer is and to predict how we can manage rainwater or risk of rising water table. Our entire village is in a flood plain area and this field anecdotally suffers from standing water as times during the winter. Next to us, a housing developer is trying to work this out as part of thier planning process. They have employed geologists and all the neighbours have developed theories so its become a hot and contentious subject. Establishibng the facts has been made more difficult by the near-drought conditions this year which have resulted in there being very little ground water to observe. We favour theory 1 as it seems to reflect what we witness; when it rains the water just sits there; where we have dug down into the Kimmerigde clay, water trickles slowly into the hole from the base of the ballast layer. On this basis, to reduce standing water on our turning circle we have drilled large holes through the surface clay and back-filled with ballast to act as a series of small soak-aways. For the polytunnel foundation we need to a, avoid floodwater coming in from the surrounding field and b, make sure that irrigation water has somewhere to go. So, having removed only a very little topsoil to achieve a level surface we have added a 20cm layer of more ballast and will add drainage channels down each side. We really have no way of knowing if this will be sufficient and will just have to wait for the rain. Who knew that so much geology would be required for horticulture. And now the solidago (golden rod) is coming into flower. What has also been very interesting is to observe that the bees pay no interest at all to some of the plants that are recommended for bees. This included the achilleas.Sadly the monarda (beebalm) flowered so poorly with the draught that the bees really didnt have much chance to show thier interest. This plant is one that will need more moisture to thrive. The idea of the bee-plot is the design a planting scheme that will ensure continuous flow of nectar and pollen throughout the season. So naturally when choosing the plants for this trial plot I was quite determined to make sure that I had a range that would ensure flowering right through the 'june gap'. Up till the first week in June this was going well but now most of the earlier flowering plants have almost finished and the next batch are still to bloom. It think the very warm spring weather had some bearing on this as it accelerated the flowering of the poppies and geranium pratense. And now it is much cooler than expected. The borage is just beginning to flower but the agastache and monarda are not quite ready. The only thing really flowering happily is the oxe-eye daisy which may not self seed when everything else gets established. I think that there will be lots of flowers by the end of the month so hopefully this is just a two week lull. All the same, it shows that the trial was necessary and I now know what to adjust in the design. We are finding that this plant is really good for many different types of bees. Here are results of our brief study: Our phacelia plot is about 24 square meters and we first studied the bee activity in June at midday in full sun for about 20 minutes. We then continued observing for more types of bee at various other times of day for 5 minutes at a time. Bee density: approximately 9 bees per square meter when in full sun, 5 per sqm at when overcast - the difference being reduced numbers of honeybees when its cloudy. The honey bees were purely collecting pollen but most of the bumblebees were after the nectar. The latter have to push their faces past the forest of stamens to get into the small centres to the petals. It was quite common to see multiple bumblebees in a single flowerhead but the honey bees will not go near a flower that has any other bee on it. The pollen is dark purple/blue and makes the bees legs look like they have a plaster on. We cast the seed on the surface in a rough patch of cleared earth in our field. Then we totally ignored it and left it to fight amongst the native weeds and grass. It has faired well with this treatment and represents just over half of the vegetation in the plot.